The cable is designed for signalling of the ZPW—2000A uninsulated Track Circuit (Jointless Track Circuit) automatic block system,and may satisfy 10KM distance request. The cable is applied in automatic machine or device of Train Control System,ground equipment of Automatic Train Overspeed Protection System, and to transmit controlling signals,monitoring information and electric energy among signalling equipment and control device in Microcomputer Railway Signal Interlocking System,Computer Supervisory System,high power switch and lock movement. It is also able to be used as transport channel of DMIS primary information,service call and area communication ,and replace "railway signaling cable (PTY Cable)" in others signal system. The cable optimize comprehensive electrical performance on further on the basis that performance indexes of TB/T 2476-1993 "Railway Digital Signaling Cable"are satisfled.The AC rated voltage is improved by 1.5 times,Core's insulation resistance increased by 2 times,mutual capacitance drop 40%,reduce transmission consumption,enhance cables' reliability.And enchance communication transmission indexes of transmission attenuation,impedance,crosstalk,etc,has the function of transmitting analog signal(1MHz),digital signal(2M bit/s) and AV750V or DC1100V power energy. In Sheilded Railway Digital Signaling Cable,the digital signal single-quad is shielded individually,so it can effectively prevent shielded quad from inner or outer high voltage interference with another and lighting a lamp,moto control ,offer more reliable transport channel to digital signal,and can transmite signal,communication,weak electricity together.The shielded quad is able to be used as railway long distance or district communication. Railway digital signaling Cable have not only nomal type,but also the types used in special environment, such as flame retadant type,anti-termite type,high moisture proof type, high shielding type,etc. 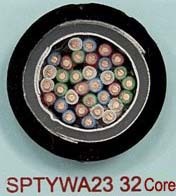 In manufacturing technique,the cable main material adopted comply with IEC Standards.Skin-foam-skin physical foaming triple extrusion technology are adopted to manufactur insulated cores. 1. Conductor of cable operating temperature should not higher than 70 ℃. 2. the operating temperature should not between -40 ℃ and +60℃. 3.Installation ambient termperature should not lower than -10 ℃. 4.Bending radius of installation Plastic sheath cable,comprehensive sheath cable,aluminium sheath digital signaling cable,non-armoured cable should not less than 20 times of outer diamenter of cable,Armoured cable should not less than 20 times of outer diamenter of cable,inner shielded railway digitial signaling should not less than 20 times of outer diamenter of cable. 5. the cable has high mechanic strength, corrosion -proof , high-impact strength and cold resistance . 1.The choosing principle and laying guard of the cable, please refer to TB 10007-99 “Designing Specification of Railway Signal Cable” and TB 10206-99 “Construction Specification of Railway Signal Cable”. 2.The laying guard of railway inner screen digital signal cable, please refer to “Construction Craft of Railway Inner Screen Digital Signal Cable” which stipulated by The Signal Construction Craft Research Institute of China Railway Communication & Signal Company. Low smoke halogen free, environmental protection type cable without public hazards, which is suitable for signal control indoors, subway or light rail. In 0.55kHz～2.6kHz, characteristic impedance temperature coefficient at 20℃ is 0.002 1/℃. Attenuation temperature coefficient at 20℃ is 0.002. The [ ] data in clause 7, 8, 9, 11 which is in the table is the index or tolerance range of shielding quad of cable. Cable with length 1000m and over do not less than 50% of total delivery length in Order, and with length less than 500m not more than 5% of total delivery length. Each cable is marked with name of manufacturer or code of factory, type and specification on outside cable sheath, distance of length mark is not more than 1m. There are following signage clearly marked on cable drum: Name of manufacturer, type, specification, length m, gross weight kg, ex-work number, manufacture date, arrow showing the correct rotating direction of the cable drum, and attached quality certification. Special sleeves are applied for sealing of both ends of the cable. The cable is wound in good order around the cable drum, the outer package is private plastic and ferula. The cable drums satisfy the requirements as stipulated in JB/T 8137. “A” end of cable is usually the outside end of package; the “B” end is allowed to be the outside of shipment, while the "outside B" is marked on the drum. The package form may be made by negotiation. The cable drum should be place erectly, not flatwise, the bump or mechanical damage to the cable should be prevented. The cable should be stored carefully, avoiding the humidity and water infiltration.